2. Add the olive oil to a skillet heated over medium low heat. Add the onion and sauté for about 15 minutes, until the onions begin to caramelize and take on some brown color. Add the garlic and sauté for 2 more minutes. 3. Add the spinach and sauté until the spinach wilts down, about 1 minute. 4. Brush the 4 flatbreads with olive oil and place on grill. Grill until the bottoms are crisp, about 2-3 minutes. 5. Turn flatbreads over and add 1/4 cup of ricotta, spinach mixture, and top with mozzarella and parmesan cheese. I completed this step off the grill because I always end up making a mess when I do it right on the grill. 6. Cover the grill and allow the cheese to melt for about 4 minutes. While they are grilling, fry four eggs in the same frying pan you used to sauté the onions and spinach. 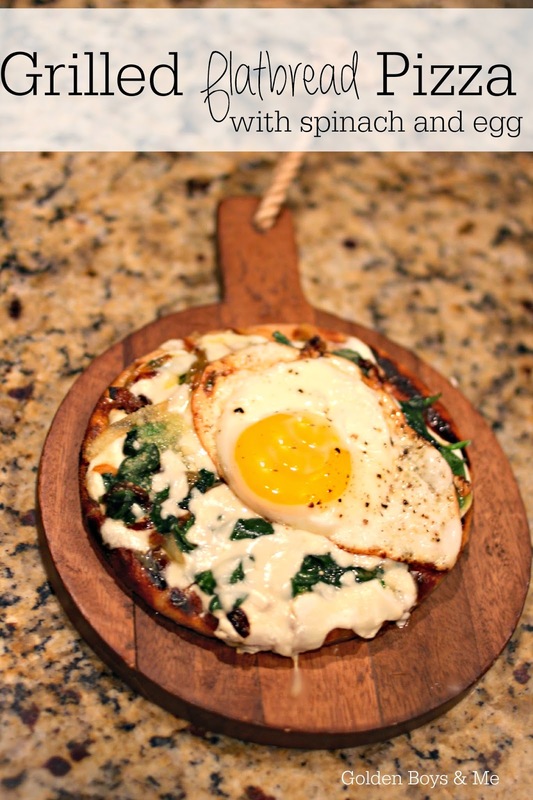 Remove flatbreads from the grill and add a fried egg to the top of each one. This sounds unusual but really delicious to me. We love an egg any time of day and in any form!